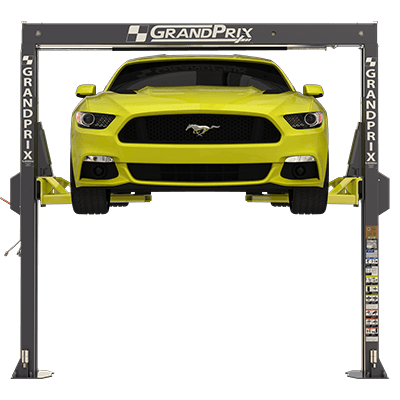 BendPak Lifts – Two-Post Lift – GP-7LC– 7,000 lb. Lifting Capacity - Gary Bloom Sales, Inc. 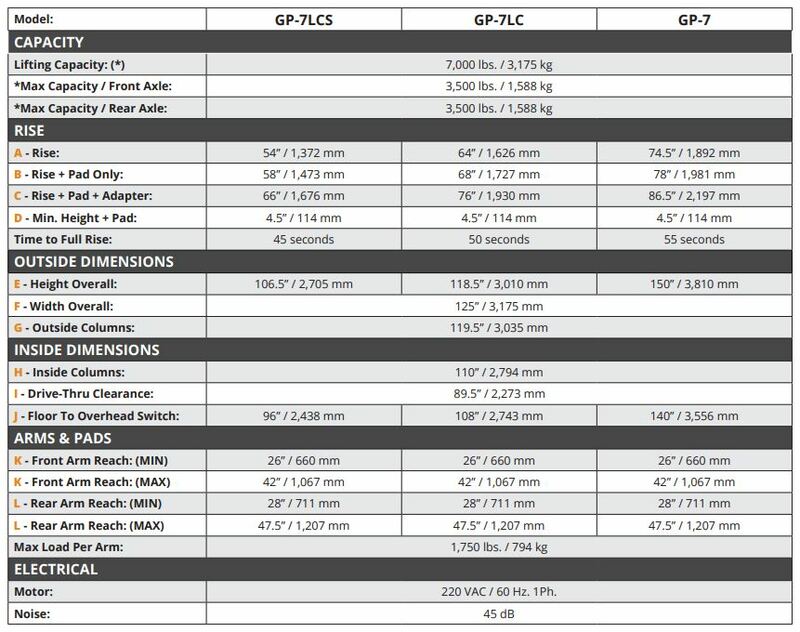 The GP-7LC is a shortened version of the standard GP-7, accommodating ceilings as low as 10′ while offering an impressive 68″ max rise. This model is truly designed for homeowners who until now could never fit a two-post lift in their garage. The GP-7LC is an incredibly powerful, 7,000-lb. capacity two-post lift that reaches a max lifting height of 68″. Never before has a garage with ceilings as low as 10′ been able to fit a lift of this caliber. There are some portable options on the market, but only the GrandPrix offers the superior safety standards of a full-rise lift in a slim, low-ceiling build. 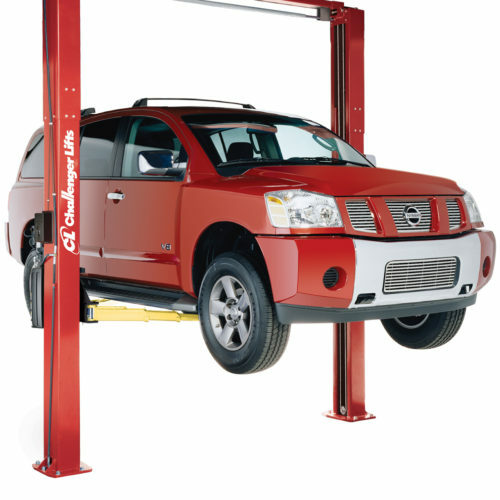 Home wrenchers have long lamented the lack of a lifting option for their garages, so they wind up settling for less premium options or low-rise options, or else they make sacrifices in the capabilities and safety features of their lift. GrandPrix’s GP-7LC truly upends everything you thought you knew about automotive repair. It lets the average Joe or Jane work on a full-rise lift from the comfort of home. This machine fits in most home garages and comes along with the best warranty in the industry. 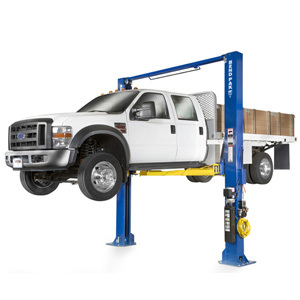 If you’ve been looking at car lifts and holding off because of space, this might just be the lift for you’ve been looking for. Space still too tight? Check out the GP-7LCS, our super-short model that offers 58″ of rise and fits in garages with 9′ ceilings. A lower column height doesn’t change the slimmed-down nature of the lift. 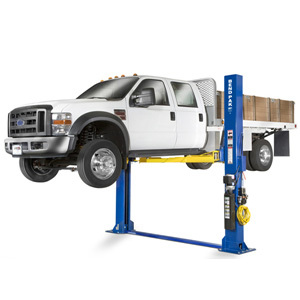 Looking at the GP-7LC, you might be surprised that a lift this compact could be over-engineered to easily lift up to 7,000 lbs. The shorter model offers the same overall width and drive-thru clearance of the standard-height GP-7. Best of all, because it offers more rise (relative to column height) than any other lift in its class, the GrandPrix doesn’t ask you to compromise on how you work. It simply adapts to your lifestyle. Like the other offerings in the GrandPrix series, the GP-7LC is unlike any other lift ever built because it features four lifting cables, two of which are redundant and supplied only as an extreme safety precaution. A 2:1 lifting speed is no joke, so we don’t take chances with your life or your property. A redundant cable is merely there in case one cable should develop slack, snap or otherwise become dysfunctional. We don’t expect one of these cables to ever come into play, to be perfectly honest, because the aircraft-quality lifting cables are extremely durable and easy to maintain. At the end of the day, the GP-7LC is as safe as any car lift ever built—arguably safer. The quadruple lifting cable system is the essential factor that allows the GP-7LC to use half as many hydraulic cylinders (one instead of two) and lift twice as fast as many other lifts. Putting the cylinder overhead lets the GrandPrix get away with less steel for the columns. We could have gotten by with two cables and hydraulic cylinder; together, they would be over-engineered far beyond the lift’s rated lift capacity. But, it’s always nice to have a backup cable, and the GrandPrix offers two! With just a single overhead cylinder lifting work, it’ll not only last for years with very little maintenance for years to come. 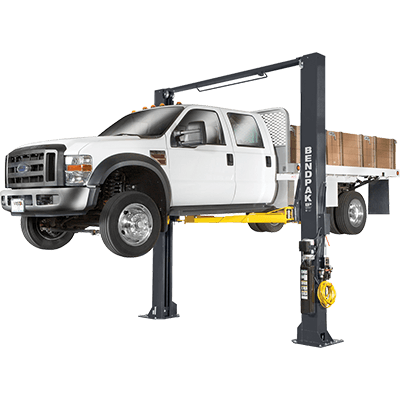 This two-post lift utilizes a Bi-metric™ telescoping arm design that can be angled for either asymmetric or symmetric lifting, depending on how you load your vehicles. Those who prefer additional door clearance can configure the asymmetric design, and those who prefer to align the arms at the center of the vehicle are free to do so. Garage space and the type of vehicle being lifted can affect which method you prefer, so we offer both! 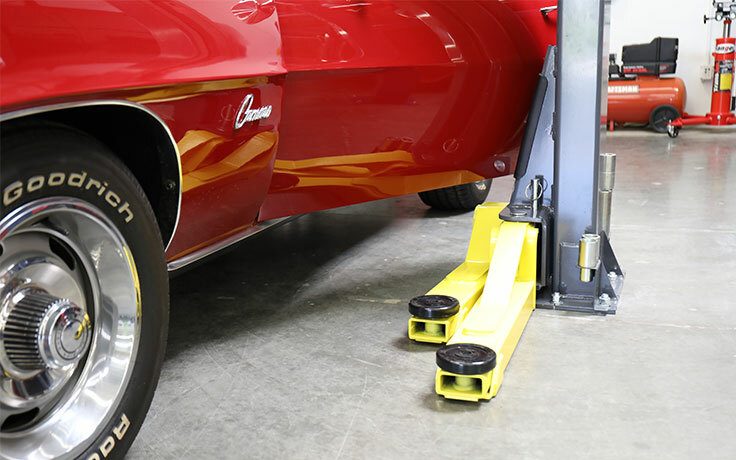 More flexibility means practically every single garage in America can now fit a premium car lift.